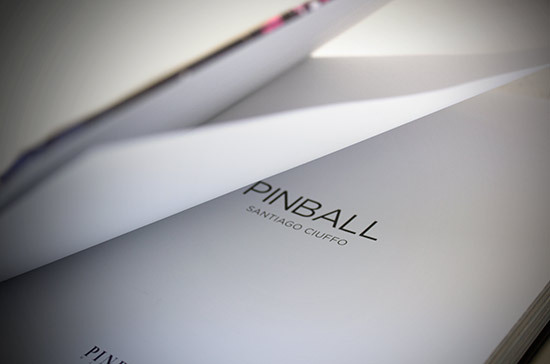 When Santiago Ciuffo published his book of pinball photographs in Argentina last year, it was well-received by his fellow Argentinian pinball fans. But legislative problems exporting from the country meant the book was not available internationally. 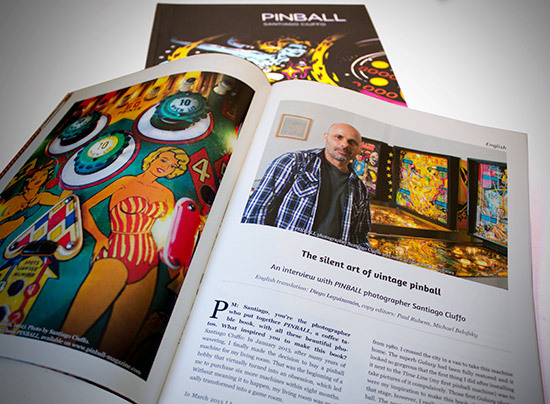 That changed when Pinball Magazine publisher Jonathan Joosten learned about Santiago's book through Facebook, and began thinking about publishing it himself. He worked with Santiago to produce the new International Edition of his book, increasing the overall number of photographs while changing a few of the existing ones. The result is the book Pinball. 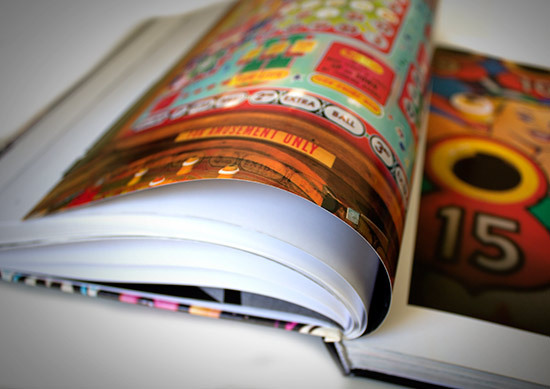 The book arrives in a shrink-wrapped package together with a special promotional edition of Pinball Magazine. 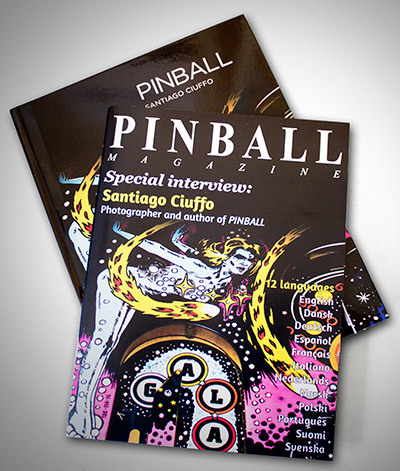 The 80-page magazine begins with an introduction to the book from Jonathan, before continuing with an interview with Santiago where he talks about his introduction to pinball, how he acquired his first machine, and how he took the photographs for his book. This is accompanied by nearly a dozen more of his photographs which didn't make it into the final version of book. To make the book's appeal as widespread as possible, the interview is repeated in twelve languages: English, Danish, German, Spanish, French, Italian, Dutch, Norwegian, Polish, Portuguese, Finnish and Swedish. 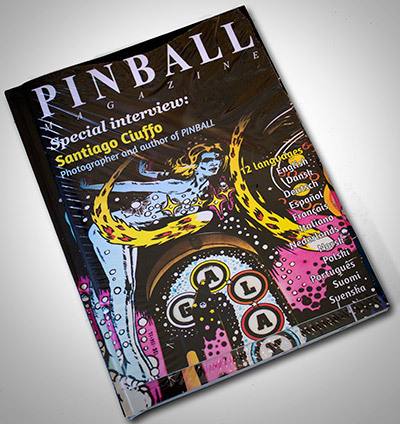 The magazine is also available to download for free from the Pinball Magazine website. Because the magazine is provided at no cost it is quite advertisement-heavy compared to a regular edition, with 30 of the 80 pages given over to pinball-related sponsorship. It is also printed on thinner paper than the regular Pinball Magazine, and stapled rather than bound. It does, however, provide a good introduction to the book's content. And so on to the book itself. 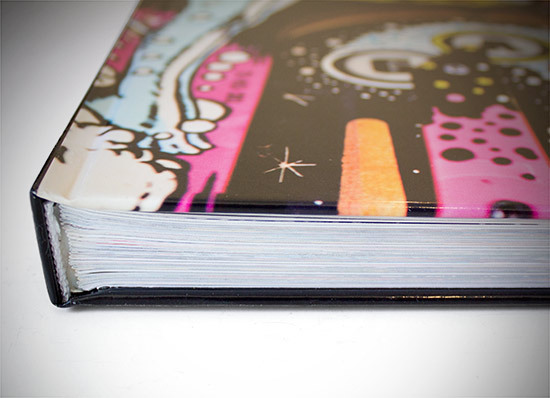 This is a coffee table book, and so is solidly bound in a glossy hardback cover. It is also reassuringly weighty, tipping the scales at 1.32kg (2.9lbs). 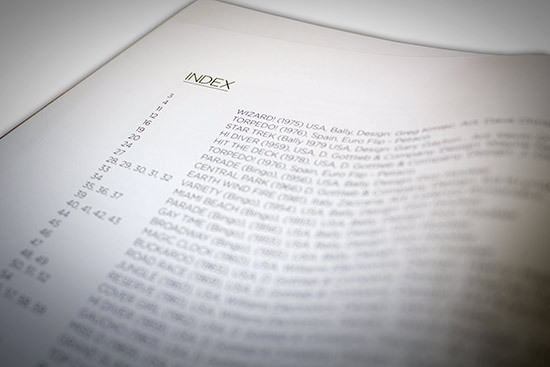 The pages are printed on agreeably heavy glossy paper stock. The spine is slightly thicker than the rest of the book at 2.2cm vs 1.8cm, while the overall dimensions are 28.5cm (11.22 inches) high x 22cm (8.66 inches) wide. 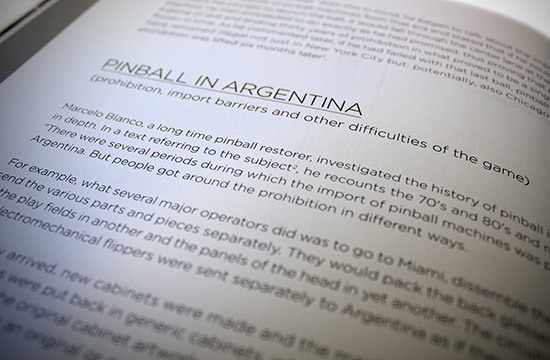 The content begins with a six page description of the state of pinball both globally and with special reference to Argentina. 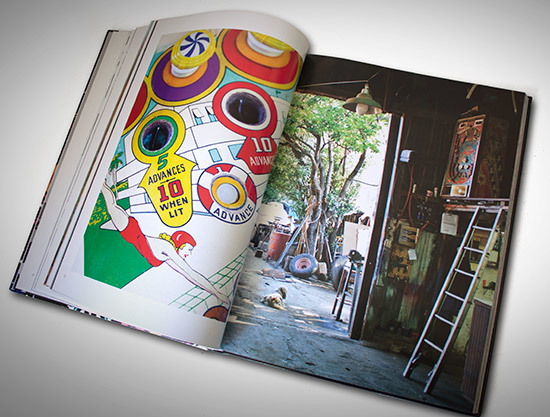 This very much sets the theme for the main photographic section of the book which concentrates on the artwork and construction details of the pre-DMD machines, punctuating these with scenes typical of the Argentinian pinball collecting, restoring and playing cultures. But before we get to that though, the introductory section is repeated in German and French. Alternative languages are catered for with a special supplement which can be ordered for €2 and provides translations of this section in Danish, Spanish, Italian, Hungarian, Dutch, Norwegian, Polish, Portuguese, Finnish and Swedish. 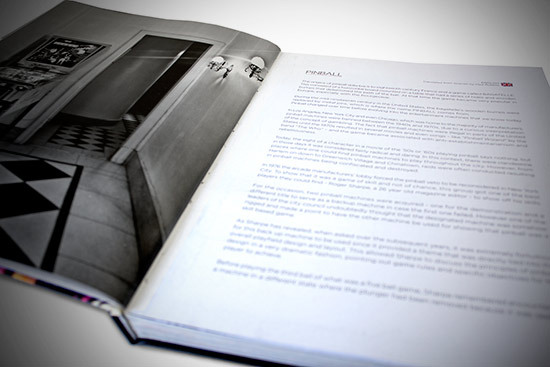 To help differentiate the introduction from the main body of the book, all the photographs in these first 27 pages are in monochrome. So it's not until page 28 that the text comes to an end and we get to the first of the 176 pages of full-colour photographs. There's no obvious thematic or chronological organisation to the photographs. However, the eclectic mix provides an enjoyable mystery of what the next turn of the page will reveal. You're unlikely to be disappointed, as page after page tells a story. Sometimes it's the artwork from a classic Gottlieb such as Hi-Diver or Dragon, other times it's a typical scene from an Argentinian barn full of pinballs. In many instances it is the pinball artist who is the real star of the page. The amazing detail in their original artwork provides endless enjoyment, even after all these years. Some of these images are allowed to stretch across both pages. There are other curiosities too, such as the side-by-side comparison of two versions of the same game produced on different continents. None of the pictures in the book are captioned but most are fairly obvious, while for those which aren't there is an index at the back of the book listing the game name, year of manufacture, manufacturing company, game designer and artist. There is also a two-page section putting some of the actuality pictures into context by explaining what (or who) they show, and what the significance is of the scene in the photograph. The first 500 orders will be shipped with a special selection of postcards featuring photographs not included in the book. There are fifteen postcards in all. 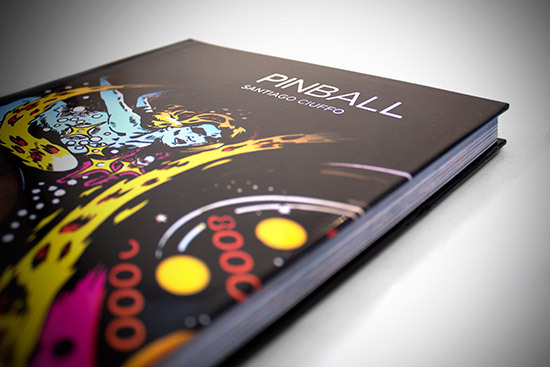 Ten will ship with the book, while the remaining five will be available to collect from pinball shows around the world. Pinball is an impressive collection of photographs take by Santiago in 2013. Like any good coffee table book, you can dive in at almost any point and find an interesting and thought-provoking picture to ponder and explore further, discovering details which may never have caught your eye before. 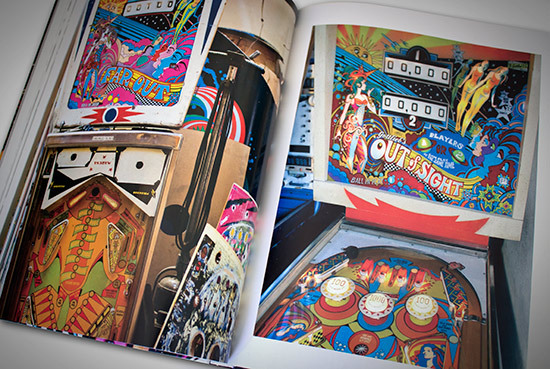 It's also the kind of book someone with no prior interest in pinball can happily leaf through, enjoying the iconic pinball compositions without feeling uninformed or intimidated. As soon as this review is completed we'll be clearing the packs of LEDs and flipper rubbers off our coffee table to give it pride of place. One request though, can we have a white LE version which doesn't show the dust so readily? Pinball costs €30.96 plus shipping which varies from €5.50 to €17.05 depending on the destination. 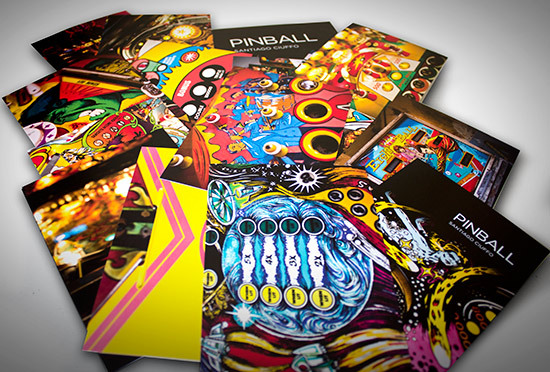 It can be ordered from Pinball Magazine's website.